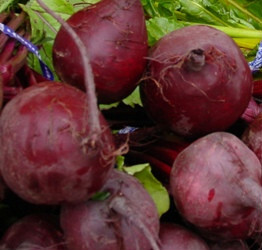 Red Beets: These beets have dark green tops. The inside of the beet is a dark red or burgundy. You can eat the greens as well– they taste like spinach. Greens will keep a few days in a plastic bag stored in the crisper. Candy Striped Beets: Candy striped beets have tops with a pink hue. The inside of the beet is pink and white striped. To store, cut the leaves form the root, leaving an inch or two of the stems attached and place in a plastic bag. 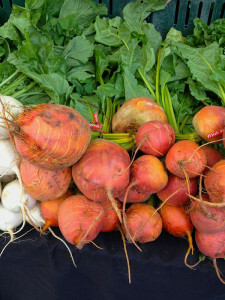 Golden Beets: These beets have tops with an orange hue. The inside of the beet is orange as well. You do not need to peel or clean the root because the skin will slip off easily during cooking. 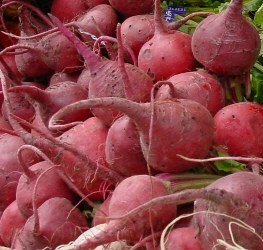 Beets can be boiled, pickled or used in salads. They can be added to soups, baked or fried. Beet tops can be used like spinach.